Funny college items are the sort of dorm supplies that keep college life interesting! 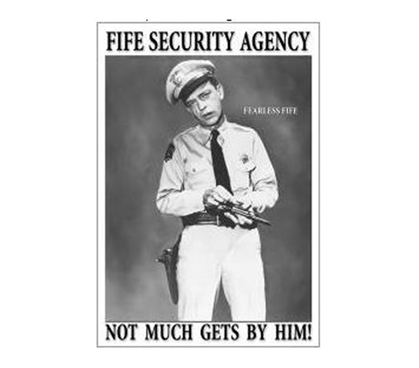 With that in mind, add cool dorm stuff like this Fife Security Tin Sign. After all, you're in college, so that means it's time to have some fun, at least with your dorm stuff! Wall decorations for dorms are the perfect dorm items to let your college wall decor stand out, and tin signs certainly are unique dorm supplies. The best stuff for college should have some distinction, so be sure you have some different sort of dorm decorations for your college wall decor. Decorating your dorm should be taken seriously ... and you can do just that by adding funny items for college!